I’ve once again tired of winter’s heavy fare. Stews, thick soups, braised meats and hearty vegetables can go on hiatus for a while. I’ve grilled already and we’ve enjoyed a summery macaroni salad. Well, hubby and I have. The kids won’t touch “alternative” salads like those with pasta or grains, like this rice salad. More for us. This particular creation came about partly because I’m also tired of lettuce salads with hothouse veggies and because I had leftover basmati rice and chickpeas begging to hook up. 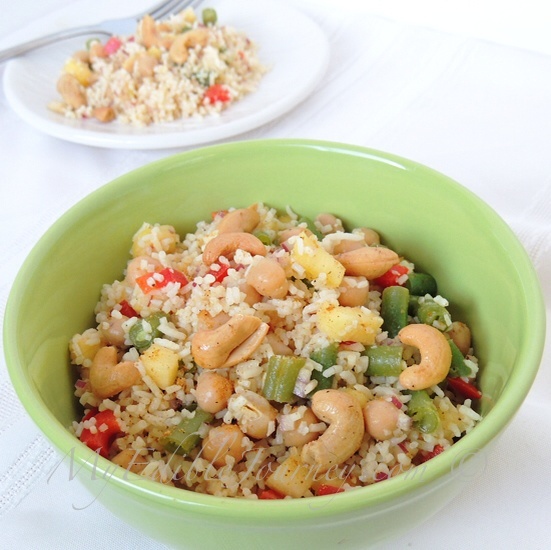 The curry powder provided a lovely bridge between them, and the pineapple and seasoned cashews offer a pleasing contrast both in flavour and texture. I don’t mind the sharp taste of raw red onion in salads, but if you’re not a fan, you can simply saute them briefly with the chickpeas and garlic, or use green onion instead. Use any veggies you like. I bought green beans, which we’re getting from the U.S now (as opposed to Chile or Mexico or further afield during the depths of winter), but fresh or frozen peas or soy beans would work every bit as well. Once fresh herbs are again bursting from the garden, I’m sure parsley and even Thai basil will find their way into the bowl. I’m sure one could even find a way to work kale into the mix (I’m looking at you, Tiffany). You may want to make more of the cashews. They make a wonderful snack all on their own (even better with a cold beer). Bring a small pot of salted water to a boil. Drop in the chopped green beans and boil for no more than 30 seconds. Immediately drain and rinse under cold water to stop the cooking. Pat dry and set aside. Preheat a skillet over medium heat and add 1 teaspoon of oil. Place the rice in a bowl and set aside. Pat the chickpeas as dry as you can and toss them with the oil in the hot pan. Add the garlic and 1 -2 teaspoons of curry powder and toss to coat, cooking just until fragrant. Remove from the heat and gently fold the seasoned chickpeas into the rice, along with the green beans, onion, peppers and pineapple. Sprinkle with the lime juice season with salt and pepper. Let it sit in the fridge for a few hours or overnight for the flavours to meld. In a medium skillet, lightly toast the cashews until brown specks appear. Add the remaining scant half teaspoon of oil and quarter to half teaspoon of curry powder. Toss to coat and set aside to cool. Sprinkle them over the salad when you serve it so they don’t get soggy. 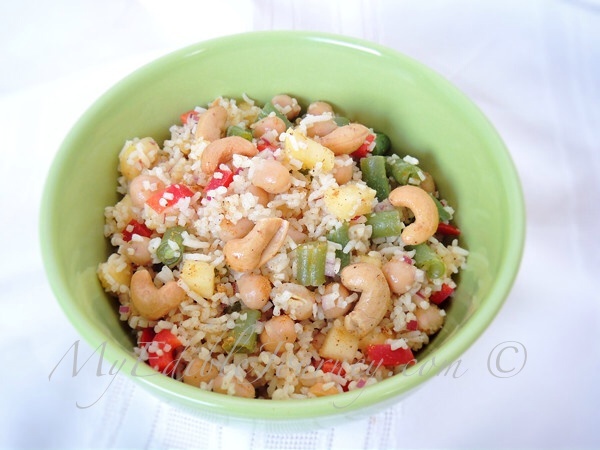 This entry was posted in Salads, Vegetables and tagged cashew, chickpea, curry, lime, pineapple, rice, salad on April 9, 2014 by Mama B.
this looks fabulous! definitely going to make a batch next week for lunches! Let me know what you think, and if you try anything different with it. I think a little diced hot pepper wouldn’t hurt.